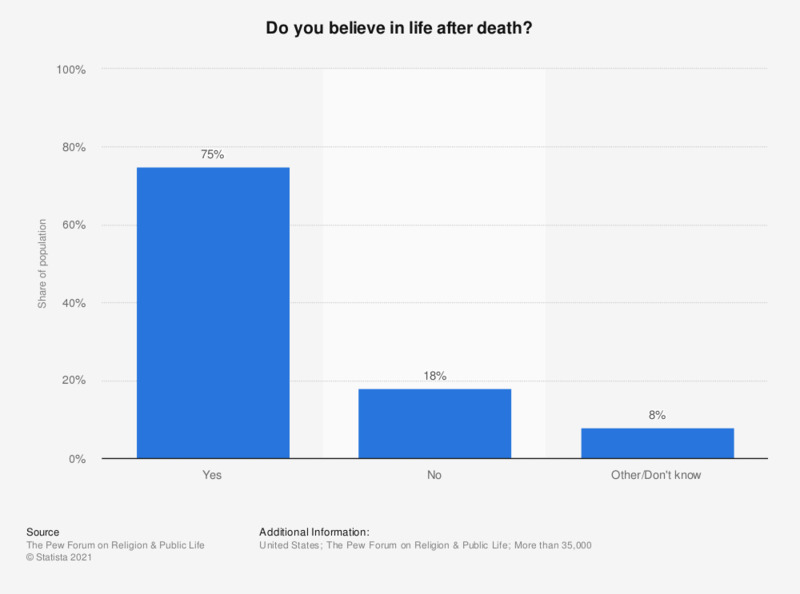 This statistic shows the results of a survey among Americans regarding their belief in life after death. The survey was conducted in 2007 as a part of the nationwide "Religious Landscape Survey" in the United States. 18 percent of the respondents stated they did not believe in life after death. The results of this poll are part of "the Pew Forum's U.S. Religious Landscape Survey, which draws primarily on a new nationwide survey conducted from May 8 to Aug. 13, 2007, among a representative sample of more than 35,000 adults in the U.S., with additional over-samples of Eastern Orthodox Christians, Buddhists and Hindus." Statistics on "Beliefs and faith in the United States"
Do you believe that God determines what happens to you? United States: How afraid are you of death? What are your views on the origin and development of human beings? How confident are you that the following is correct? :The universe is so complex, there must be a supreme being guiding its creation. How confident are you that the following is correct: Life on earth, including human beings, evolved through a process of natural selection? How would you rate the state of moral values in the United States today - excellent, good, only fair, or poor? Do you think married men and women having an affair is morally acceptable or morally wrong? Do you consider gambling morally acceptable or morally wrong? United States: Do you believe any of these superstitions? Do you believe there is a God or a greater divine power? Did you pray to God or a greater divine in the last two years when you've been in a serious situation (illness, fear etc. )?